while i was at sunway pyramid yesterday morning (collecting some particular concert ticket) with nqw, we stop by at Samsung's outlet. 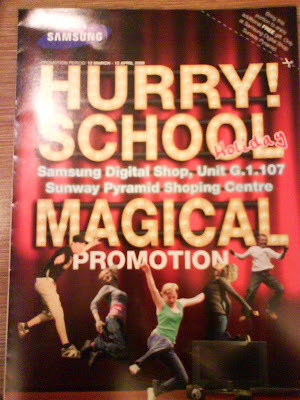 then, picked up a flyer for their promotion (valid from 13march until 12april) which looked strangely familiar. if you dont know what this is, you are way behind time. although i am not a great big fan of HSM or Samsung, but i must say i dont believe in infringement! its blatantly selfish and demoralizing to the original creator (in this case Disney vs. Samsung). gosh, you still dont know what Samsung's flyer resemble? THIS is what the original looks like. apparently Samsung was using Disney's High School Musical image without permission, to create a sensation to attract attention of the young (perhaps they were thinking, Samsung gadgets for cool kids) because it was the school holidays during 13-22march. 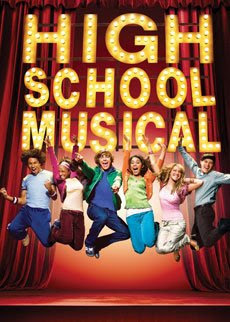 if they did receive prior permission, why in the world would they have to 'fake' HSM image with "Hurry! 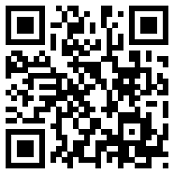 School Holidays Magical Promotion"? INSIDE the flyer, Samsung advertises their products and gadgets (no, i am not going to promote what they sell by taking a photo of it too). it also seems that their designers at Samsung are trying to imitate HP flyer's style by using an external attachment to their product (except that HP does it with permission because they dont try to 'hide' the fact they are using an outsider image). so what? Samsung promotion is almost ending, and Disney did not sue them. does that not show how ignorant we are? HSM fans must do something. Hahaha. Funny! Even d color of their costumes is almost the same. Haha. How lack of creativity man! kelvin> indeed! as a designer they shouldnt do that without permission.